I used to have a hobby room. It was awesome! It was my own personal space to create, store, and do whatever I wanted. Then I got pregnant, and the room was quickly emptied out and turned into a nursery. In the process, a bunch of stuff was donated, more stuff was put into storage at my parents' house, and I lost a whole closet's worth of space. My "cave" was gone. In many ways, my personal space has become my kitchen. The kids can't get to me because of the gates, and Sean pretty much leaves me to do whatever I want in there. 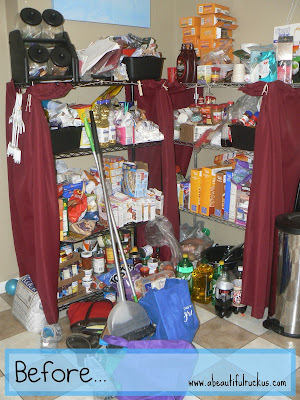 The only problem was that the kitchen was insanely cluttered and unorganized. I can't think in cluttered places, and so it really felt more like a hostile space than anything else. 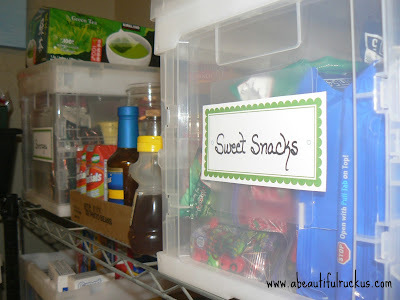 Organizing my kitchen...particularly my pantry...has been on my to-do list forever. It's been like having a perpetual New Year's Resolution for years. This is what it has looked like for eons. 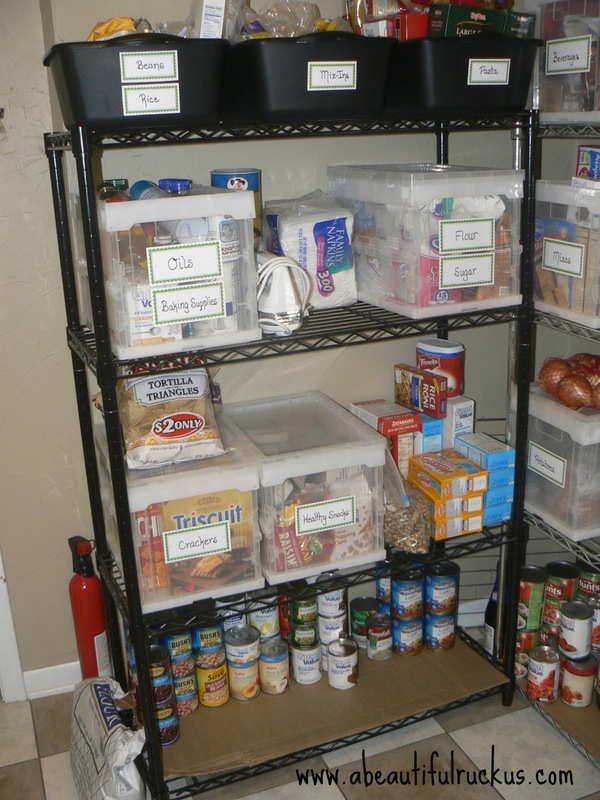 Our house is small, and we have no pantry space, so we use shelving units instead. Everything was just thrown on the shelves. The spot in front of it became a collection point for things I didn't want the kids to get into. Generally, an eye-sore and an uncomfortable place for me to work. 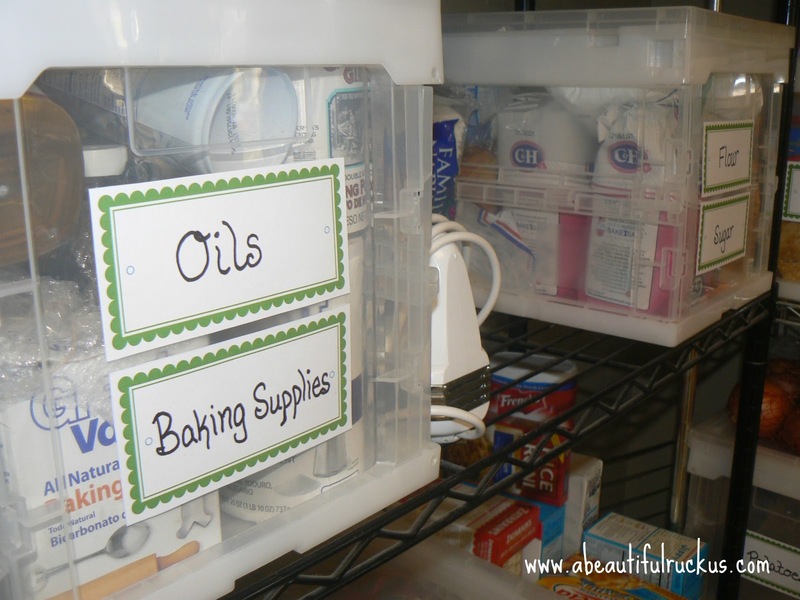 I finally stopped long enough to organize and label everything. 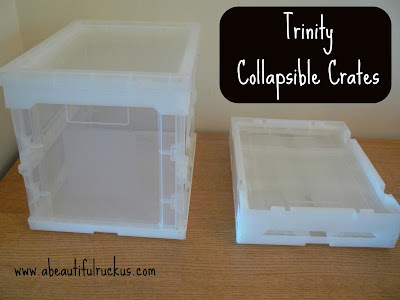 I got my hands on ten of these collapsible boxes from Trinity. 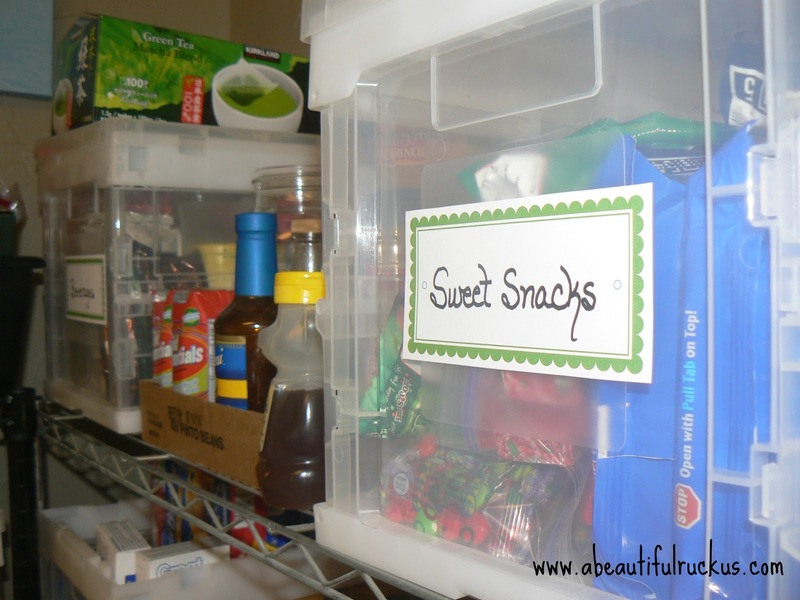 They are the perfect size to fit on my pantry racks. And since they easily collapse, if I ever find myself not needing one, they won't take up much space in our already tight house. The idea is that each box holds a category of food. If I'm baking, I normally need baking powder, salt, and vanilla. If I'm cooking, I normally need several spices. Now that the items are categorized, I can just grab a box, pop it on the counter, and have everything I need right at my elbow. 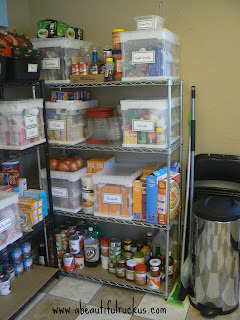 When I'm done, the box goes back on the shelf and...voila!...my kitchen stays clean and organized! My kitchen literally feel lighter, brighter, and twice as big now. I'll take it! If you want to check out the boxes that I have, you can click HERE. They also have a bigger size that collapses as well. One of the perks they offer is free shipping in the continental United States (contact for a quote if shipping elsewhere) on all of their products! And if you decide to pick up some of your own boxes, A Beautiful Ruckus readers can use the code, "CLEVER0113" by February 17, 2013 to get 15% off your entire order. 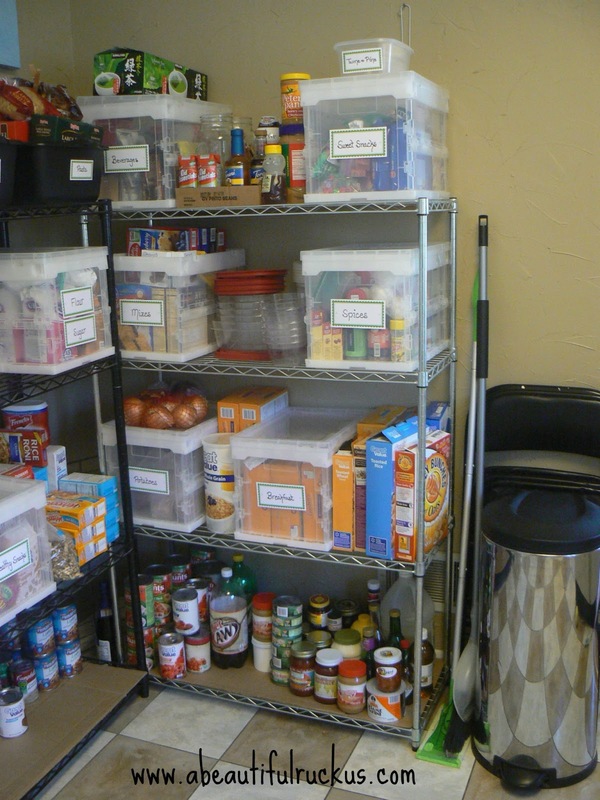 Open Pantry: Clean and Organized!! For it still being January, I feel incredibly accomplished. It took me several hours to completely redo everything, but starting the new year like this gives me hope that this will be a great year of being organized! Fantastic post! I can sooooo relate! 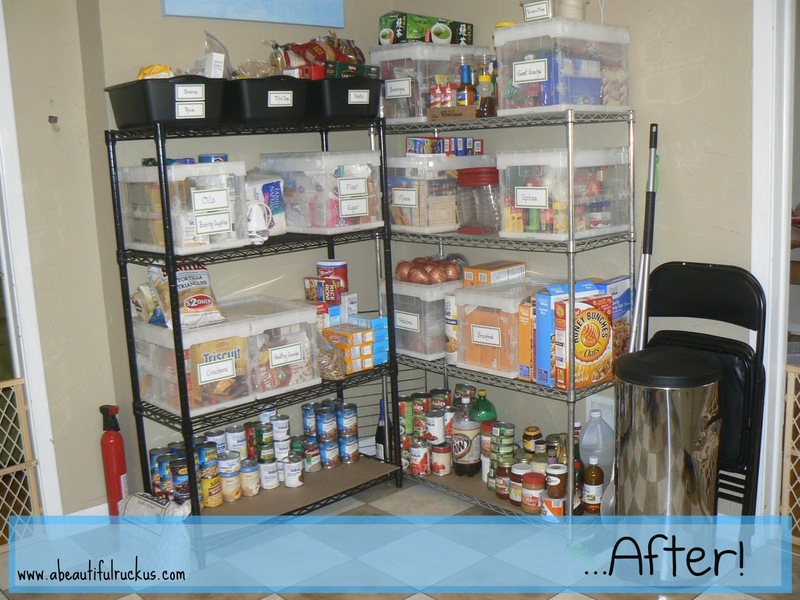 I had everything open before and had to seek solutions bit by bit - and those solutions changed as our family grew. 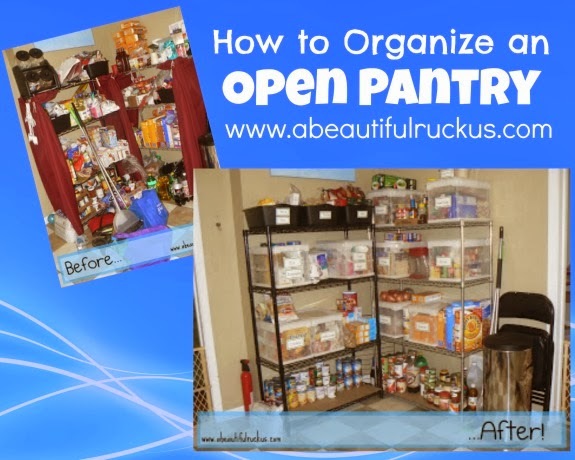 Your open pantry a terrific use of your space. God really uses those small homes in our lives in some pretty big ways that are really easy to miss or not see yet at the time! Indeed! 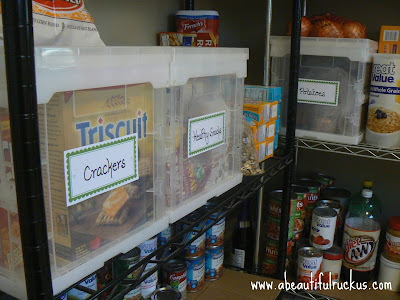 Someday, I'd love to have a closed pantry, but I know I would still want to keep it organized. Chaos behind doors is still chaos! Lol! My kids are toddlers just like any other kids. They do get along pretty well, but definitely know how to push each other's buttons. I did this project in bits and pieces over a few days when the kids let me or when Sean was home to help with them. I agree! I grew up in a house with one bathroom, and let me tell you, that makes you pretty close as a family. Maybe a little too close... haha! Seriously though, it was a real blessing to live in a small space.